Pet ownership is on the rise in the United States. According to 2017-2018 American Pet Products Association data, 68 percent, or 85 million families in the U.S. own a pet. That’s up six percent from 2014. And, more than ever before, we are including our pets in many of our daily activities, dining out and vacations. No doubt about it, we love our pets—our furbabies—and want only the best for them. That includes quality medical care, whether for routine checkups, in emergency situations, or when we sense there is an underlying disease present and are seeking a diagnosis. Local veterinarians are responding to the needs of their clients by providing expanded services, utilizing the latest in technological advances to diagnose and treat ailments, and in some cases, either building a new facility or creatively adding on to more fully serve the growing pet population. Doctors Dan Nietz and Mike Strecker and staff of the Zumbrota Veterinary Clinic moved into their new facility on Roscoe Avenue, in the new commercial development along the Highway 52 interchange, in early January. The clinic was previously located in the heart of Zumbrota, in a building that dates back to 1978. The new building, Strecker says, is slightly larger, but has a much better floor plan, thanks to the design help of a veterinary-specific architect. Until 2010, the clinic served both large and small animals but now specializes in small animal care only. This shift informed many of the clinic’s design elements. The new facility includes a centralized lab area, four exam rooms with one dedicated solely to cat care, a larger surgery suite with new EKG and respiration monitors, and a larger treatment area. A three-zoned heating and cooling system provides the clinic with better odor and infection control. The surgery suite has two tables, allowing both doctors to perform surgeries simultaneously, and a window into the room gives pet parents a view of the surgery in progress. Also new to the ZVC is a Comfort Room, designed with sensitivity to the pet owner who is facing a difficult prognosis or having to make the ultimate decision and be with their pet during euthanasia. Each exam room is equipped with a combination lift table and scale, an advancement that Strecker says is extremely helpful. The dog steps onto the table and, with a push of a button, is lifted to the proper height for examination. The doctors also have installed a new computer system with web-based technologies and easy access to online medical records. With all the new building has to offer, doctors and staff at the ZVC are looking to the future, planning to provide more orthopedics services and performing more routine spay and neuters for Paws and Claws Humane Society. 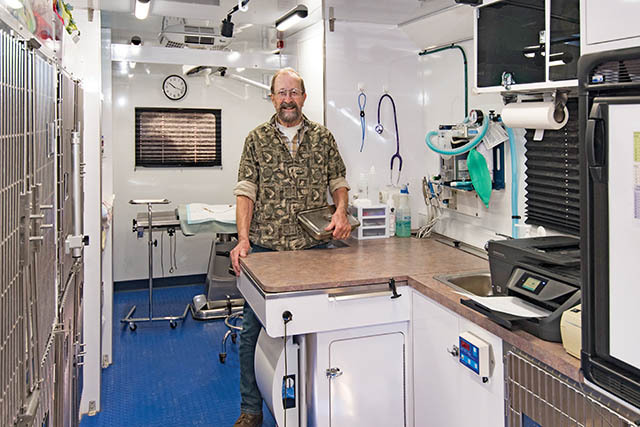 Dr. James Gute says the new mobile surgery suite, an RV-like unit located just feet from the Owatonna Veterinary Hospital, has been beneficial in helping staff cope with a space crunch at the clinic. The veterinary practice has been growing rapidly over the last eight years, explains Gute, averaging approximately two new clients each day, and the hospital needed more space to accommodate the additional staff and patients. The mobile surgery suite, often requested by patients, is consistently booked out two weeks. It includes two operating tables and accompanying equipment, allowing for a surgery and another service, such as a dental procedure, to be occurring simultaneously. Seven kennels in the suite house pets post-surgery. In January, Dr. Lauren Dinsmore, veterinarian at K-M Regional in Kasson, began using ultrasound technology, in addition to the more traditional digital x-rays, to aid in diagnoses. Dinsmore says the ultrasound equipment, which is in use every day at the hospital, helps her to hone in on treatment for a variety of disorders, including lymphoma, inflammatory bowel disease and heart problems. Veterinary medicine has made significant advancements in recent years, providing, in some cases, a similar quality of care to that of human medicine. That speed has been improved with advances such as digital x-rays, online stores that stock a broad range of treatment options that can be delivered in a day or two, and the ongoing development of new medications that are helping pet owners take care of their furry friends. What has also been very beneficial, Mannix says, is the advent of telemedicine, the exchanging of medical information for the purpose of improving a patient’s health. “I am able to send a digital x-ray to a radiologist anywhere in the world for a second opinion,” Mannix said. New medications are being developed all the time, and according to Gute of the Owatonna Veterinary Hospital, an advancement he says has been “tremendously helpful” is the new anti-anxiety drugs for pets. Their use aids the veterinarian during an examination. “Some cats won’t let you touch them,” Gute explains. “The anti-anxiety drugs take the edge off that, they are much more cooperative.” He says they can also be helpful for animals with noise phobias, the fear of thunderstorms, fireworks, or even just having company in the home.